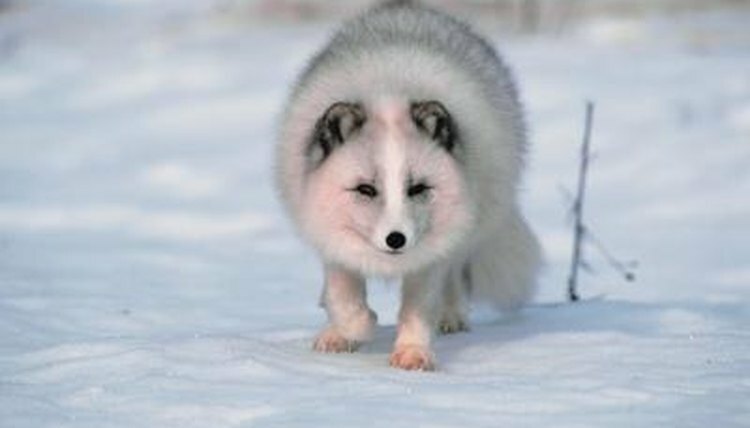 The snow-white fur that covers arctic foxes in winter insulates them from the bitter cold more effectively than the fur of any other animal in the world, including the polar bear. These foxes aren't much larger than small dogs, weighing only 12 to 15 pounds and measuring 2 to 3 feet in length. Although the demand for their uniquely beautiful fur has decreased in the West, it continues to grow in China. In the Arctic, where winter temperatures can plunge as low as 50 degrees below zero Fahrenheit, animals' survival depends upon being able to stay warm, escape predators and find food. Arctic foxes' winter coats, which cover their entire bodies, even the undersides of their paws, help them do all three. Since the Arctic is devoid of trees, there's virtually nothing for these foxes to hide behind. Their white coats makes it hard for predators like polar bears to see them against the snow and ice. Since arctic foxes often trail polar bears in winter to scavenge what's left of their kills, this camouflage reduces the chances they'll become snacks. In North America's Arctic, 95 percent of foxes have pure white winter coats, but a few are blue-gray, a coloration seen in about half of Greenland's arctic fox population. The fur of the arctic fox consists of two types of hair. The longer and coarser outer layer, called guard hairs, are the most visible. The finer, denser hairs in the layer below that, called underfur, provide most of the insulation against the cold. Color -- or lack of it -- also makes a big difference. White hairs, which have no pigment, are hollow and therefore able to hold air inside them. This air, warmed by the fox's body heat, prevents the cold air outside from reaching the animal's skin. In winter, the depth of the arctic fox's fur increases by 200 percent, and both layers are heat-saving white. When Arctic spring starts to arrive in May, that heavy winter coat could become a liability by overheating the animal's body. But once again, the crafty fox outsmarts the weather, this time by shedding his dense underfur for a much shorter, thinner coat. Just as the landscape gains color when the ice and snow melt, so does the color of the arctic fox's fur, while still maintaining the advantage of camouflage on the tundra. Until September, when the weather starts to turn wintry again, the fox will have a two-tone coat, dark brown on top and blond on the underside. In spring, the fox also drops his solitary ways, moving inland to mate, congregating with others in large, communal underground dens that have separate living quarters for different fox families. Arctic foxes are monogamous -- once they mate, they stay together for the rest of their lives. In early summer, female foxes, called vixens, give birth to litters consisting of six to 12 pups. For the first month and a half of their lives, these helpless little ones depend entirely upon their parents. While their mothers stay in the den caring for them, their fathers hunt for food to bring back to their families. At the end of the summer, the parents will go their separate ways, leaving the pups to fend for themselves. Since they are highly desirable prey for many other animals, only the strongest, smartest and luckiest are likely to survive long enough to have pups of their own.